Canadian families and unattached individuals had a median after-tax income of $57,000 in 2016. Median after-tax income increased from 2011 to 2014, but held steady in 2015 and 2016. The slower growth in 2015 and 2016 was associated with the resource price slowdown, which began in the second half of 2014. After-tax income is comprised of income from market sources and government transfers. Market income includes employment income, retirement income and income from investments, while government transfers include benefits to seniors, child benefits, Employment Insurance benefits, social assistance and other benefits. While growth in overall median after-tax income slowed in 2015 and 2016, there was also a significant increase in government transfer income. Median income from government transfers rose from $5,800 in 2014 to $7,400 in 2016. About half of this rise was due to increased child benefits, which became a larger source of income for families with children. In 2014, the median child benefit received by couple families with children were $2,500. This rose to $3,400 in 2015, and to $4,000 in 2016. For a lone-parent family, the median benefits rose from $5,100 in 2014 to $5,800 in 2015, and then to $6,400 in 2016. Couples with children had a median after-tax income of $94,500 in 2016, up 5.6% from 2012. Lone-parent families had a median income of $44,600, while couples without children had a median after-tax income of $76,400. Unattached non-seniors had an after-tax income of $30,400. Senior families, where the highest income earner was 65 years of age or older, had a median after-tax income of $57,800 in 2016, up 4.7% from 2012. Overall, market income (up 8.7% since 2012) has contributed more to this growth than government transfers. Unattached seniors had a median after-tax income of $26,100 in 2016. According to the after-tax low income measure (LIM-AT), 4.6 million people or 13.0% of the population lived in low income in 2016, down 1.2 percentage points from almost 5 million people in 2015. Provincially, British Columbia (-2.9 percentage points), Manitoba (-2.3 percentage points) and Quebec (-2.2 percentage points) all had lower LIM-AT rates in 2016. For children under 18 years of age, 957,000 or 14.0% lived in low income in 2016, down from just under 1.1 million or 16.1% in 2012. The child low-income rate of 14.0% in 2016 was relatively low by historical standards, including the most recent low of 14.7% in 2014. There were 828,000 (14.2%) seniors living in low income in 2016, virtually unchanged from 2015. Low income was particularly high for unattached seniors. Senior men not in an economic family had a low-income rate of 32.5%, compared with 34.3% for women in the same demographic group. According to the LIM-AT, low income among seniors has been steadily increasing since the mid-1990s. In 2016, 20.7 million people had employment income, virtually unchanged from 2015. Median employment income for all workers was $33,300 in 2016, up 1.8% from 2012 but virtually unchanged from 2015. In 2016, 11.5 million people worked both full year and full time. Median employment income for these workers was $51,700 in 2016, up 2.0% from 2012. Alberta ($59,000) had the highest level in 2016, while Prince Edward Island ($44,000) had the lowest. Since 2012, median employment income among full-year and full-time workers has risen in four provinces: Newfoundland and Labrador (+7.7%), New Brunswick (+6.3%), Manitoba (+5.0%) and Quebec (+4.7%). Alberta, Canada's largest oil producing province, was still adjusting to the consequences of a rapid drop in world oil prices in 2016, which started in the second half of 2014. Although Alberta continued to have the highest median employment income among the provinces, it also experienced the largest year-over-year decrease for 2016 at 6.3%. In addition, the number of people employed full time and full year fell 6.3% in 2016, from 1.5 million to 1.4 million. This decrease was largely driven by men, whose ranks fell by 7.5%, from 844,000 workers in 2015 to 781,000 workers in 2016. Families and unattached individuals in Alberta became more reliant on Employment Insurance (EI) benefits. Since the oil price drop in 2014, the number of families and unattached individuals receiving EI benefits rose by 53.6% to 275,000 in 2016. Among this group, the median benefit received rose from $5,800 in 2014 to $8,300 in 2016. Men aged 25 to 54 in Alberta have seen the largest increase in EI use. The number of EI recipients among men in this age range nearly doubled, from 64,000 in 2014 to 125,000 in 2016, while their median benefits rose from $5,000 to $8,600. In comparison, women aged 25 to 54 had no change in their median EI benefit received. Despite the changes in the labour market, the Alberta after-tax low income rate of 8.1% remained the lowest among the provinces. Similar to employment income, families and unattached individuals in Alberta ($70,200) also had the highest median after-tax income in 2016, while Quebec had the lowest ($49,500). Since 2012, Newfoundland and Labrador (+7.7%), Manitoba (+6.3%) and British Columbia (+5.6%) all had increases in their median after-tax income, while the other provinces had little or no change. The Canadian Income Survey estimates are based on probability samples and are therefore subject to sampling variability. As a result, estimates will show more variability than trends observed over longer time periods. In this release, differences between estimates are reported only where they are statistically significant at the 95% confidence level. An economic family refers to a group of two or more persons who live in the same dwelling and are related to each other by blood, marriage, common-law, adoption or a foster relationship. This concept differs from the census family concept used for subprovincial data in the Annual Income Estimates for Census Families and Individuals. This release analyses income on the basis of medians. The median is the level of income at which half the population had higher income and half had lower. Dollar estimates are expressed in 2016 constant dollars to factor in inflation and enable comparisons across time in real terms. 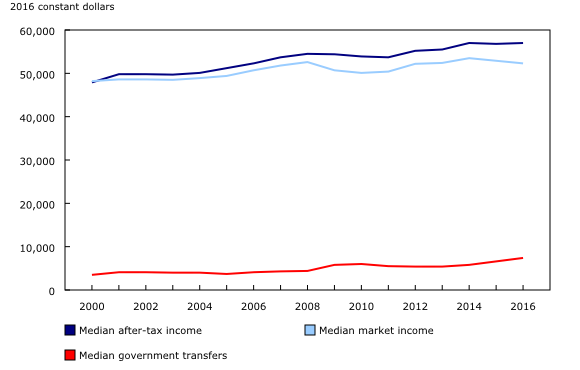 After-tax income is the total of market income and government transfers, less income tax. Market income consists of employment income, private pensions as well as income from investments and other market sources. Employment income consists of wages and salaries, commissions, net-income from unincorporated non-farm and or professional practice and net farm self-employment income. A full-year full-time worker is a person who is 16 years of age and over, who was employed 52 weeks in the year, and worked on average 30 or more hours per week. Government transfers include benefits including Old Age Security, Guaranteed Income Supplement, Canada and Quebec Pension Plan, Employment Insurance, Social Assistance, Goods and Services Tax Credit, provincial tax credits and various types of child benefits. Low income in this release is calculated using the after-tax Low Income Measure (LIM-AT). Individuals are defined as having low income if their adjusted after-tax income falls below 50% of the median adjusted after-tax income. Adjusted after-tax income is derived by dividing household income by the square root of the household size and assigning this value to all persons in the household. The infographic "The income of Canadians," which is part of Statistics Canada — Infographics (Catalogue number11-627-M), is now available.